One Off Workshops in September! We’re excited to announce we’ll be running some short courses in Longform Improv, Musical Improv and Sketch Writing in September. Spaces are already filling up so don’t miss out! 2nd & 3rd September (Saturday and Sunday): Longform Improv Workshop. Limit of 12 spaces. £50 for the two days. Want to work on longer narratives? Deeper characterisations? More interesting relationships? We will look at a number of formats as well as focusing on editing scenes from within. Create comedy character monologues and devise sketches using different techniques to generate material. A crash course in writing sketches individually and collaboratively. No background in Improv necessary. Rachel Wareing will go through the basics of Improvised song, moving into song based games and scene work. Great for anyone wanting to learn a new skill or develop confidence in singing without a script! No background in music or singing necessary. All workshops will take place at the Kings Arms Salford. Anyone who signs up on the Longform course will get free entry to September’s Let’s See What Happens. Spaces are also filling up for our Foundation in Improv and Beginning Stand Up comedy in October. Check out our workshops page for more information on all of our upcoming courses! Festival Season Is Nearly Upon Us! Festival season is nearly upon us and we’re delighted to be involved in some really exciting events this summer! We’ll be appearing at DEERSHED FESTIVAL 8 in June and we’re incredibly excited to be taking part in what promises to be a fantastic weekend of shows and workshops. Deershed is a weekend festival for families featuring comedy, music, arts, science, workshops, film, theatre, poetry and food. We’re really proud to have been asked to take part and hope to see you there! Tickets are on sale now and you can find the whole line-up of events at the Deershed website. See, we can learn scripts too! We’re also back at the GREATER MANCHESTER FRINGE FESTIVAL in July with Let’s See What Happens and Bang Bang. We’re also producing Auntie & Me, a darkly comedic play. Tickets are now on sale for all GM Fringe shows here. Let’s See What Happens at the Greater Manchester Fringe! Finally, we’ll once again be joining our friends at Laughing Horse Free Festival for the EDINBURGH FRINGE FESTIVAL this August. As always ComedySportz @ Edinburgh is a free show so no need to pre-book tickets however you can now pre-order your free Edinburgh Festival Guide here. 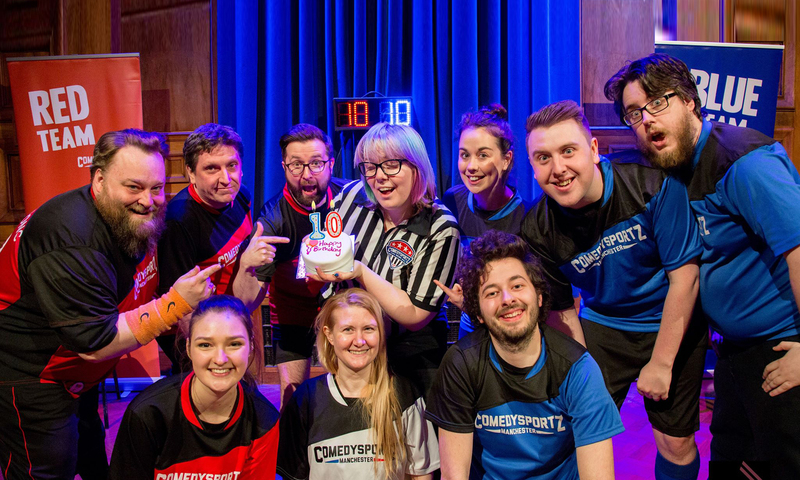 We’ll have more info on all the places you can see ComedySportz in Edinburgh in a couple of months. Notes: Auntie & Me’, by Morris Panych, is a delightful and mordant black comedy about life, loss and loneliness. When Kemp receives a letter from an aunt who claims she is “old and dying”, he travels across the country to see her off. But when she insists on staying alive he decides to see her off himself… Last seen on the UK stage as a West End production starring Alan Davies, this revival of Canadian writer Morris Panych’s ‘Auntie & Me’ promises wit and warmth with a deliciously dark edge. Auntie & Me is a whip-smart comedy drama that explores loneliness and connection with humour and emotion. Part of the Greater Manchester Fringe Festival.